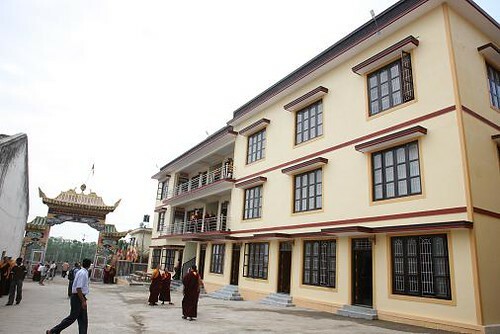 On 26th April 2009, at 8.30 am, Kyabje Karma Kuchen Rinpoche, Mugsang Kuchen Rinpoche, Khenchen Pema Sherab along with all the officials of Namdroling Monastery gathered before the new office building of the shedra (Ngagyur Nyingma Institute) and recited the Prayer to the Eight Auspicious Ones before Kyabje Karma Kuchen Rinpoche cut the ribbon to inaugurate the building. 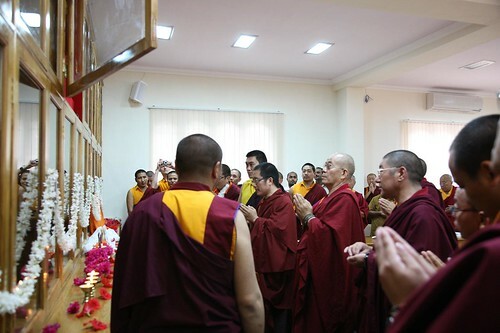 All the dignitaries climbed up to the third floor of the building to enter the new conference hall where Kyabje Karma Kuchen Rinpoche, Mugsang Kuchen Rinpoche and Khenchen Pema Sherab lighted the butter lamp. As soon as everyone was seated, the General Secretary of Ngagyur Nyingma Institute introduced the proceedings of the inauguration. After that, the Prayer to the Eight Auspicious Ones, The Prayer to fulfill all Aspirations and The Prayer to Pacify all Obstacles were carried out together in the hall before the tea and sweet rice (desi) were served to all. At this time, the Treasurer of NNI read out the statement of audit that clarified the income and expenditure for the new building. The Rabne or the consecration ceremony of the three statues at the altar of the conference hall was carried out by HH Karma Kuchen Rinpoche, Mugsang Kuchen Rinpoche and Khenchen Pema Sherab. HH Karma Kuchen Rinpoche then bestowed gifts and khatas as a token of gratitude to Lama Dhondup Dorje, the sponsor of the building, as well as to other Indian architects who were involved in the construction. Khenchen Pema Sherab and HH Karma Kuchen Rinpoche then gave speeches of thanks and advice to all those who were gathered for the smooth functioning of the building. 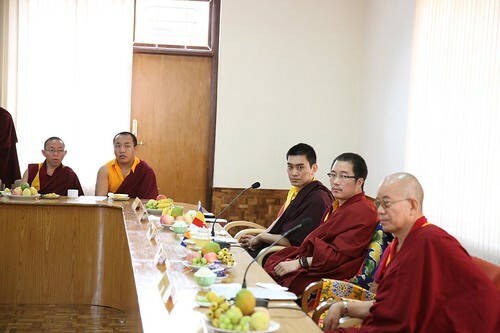 The inauguration ended after the vote of thanks by the President of NNI, Khenpo Khyentse Norbu and visit to all the different offices within the building. Lunch was served to all at the new canteen which is situated in the ground floor of the new building. Written by the Editorial Committee of Ngyagyur Nyingma Institute; translation by Lopon Sonam Tsewang.